Take a tour of bravery, determined battles, and bold resistance … and of campfire stories from the struggle to establish the State of Israel. On 29 November 1947, the United Nations called for the establishment of two states on the territory of the British Mandate in the <?xml:namespace prefix = st1 ns = "urn:schemas-microsoft-com:office:smarttags" />Land of Israel. The following morning war broke out, followed by much bloodshed and ending with the establishment of an independent Jewish state in the Land of Israel. Let us embark on a tour tracking the stories of heroism that led to the founding of the State of Israel, through the most difficult war that the renewed Jewish Yishuv yet knew. 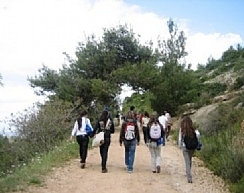 Possible tour routes include: San Simon, the Jewish Quarter of 1948, Kiryat Anavim, Shayarot Range (Reches Shayarot), the Castel.